For many of us – at least in America – the phrase ‘portable school building’ calls to mind squat, bland, beige trailers clad in vinyl siding and smelling of formaldehyde. Such buildings can seem like the lowest common denominator in architecture – a structure upon which not a whit of creativity has been wasted. 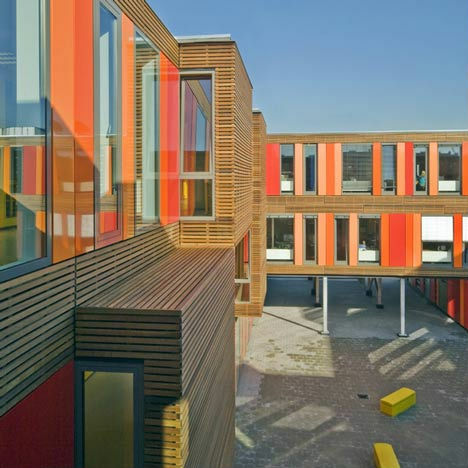 But in Amsterdam, at least for the Het 4e Gymnasium, the opposite is true: HVDN Architecten has designed a school that is temporary and modular, but still thoughtful and beautiful. Sited on an open industrial lot in the neighborhood of Houthavens, the school – which is just a placeholder for the permanent one that will come in five to ten years, once zoning issues are resolved – can easily be moved to a new location to make way for new construction. But Het 4e Gymnasium definitely doesn’t look disposable. 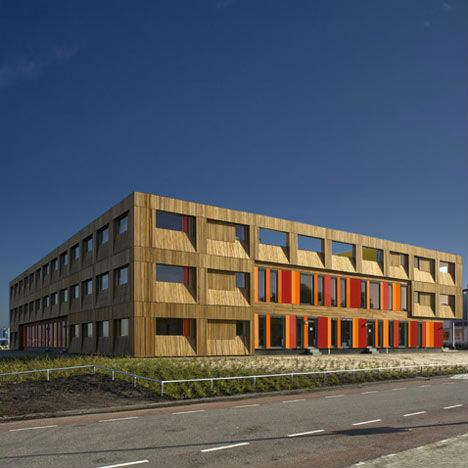 Dutch firm HVDN gave it a lively feel with a wooden facade punctuated by colorful aluminum panels. 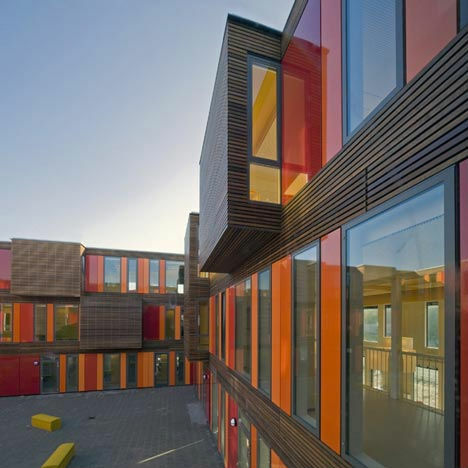 The building has a square floor plan around a large courtyard that functions as the heart of the school. 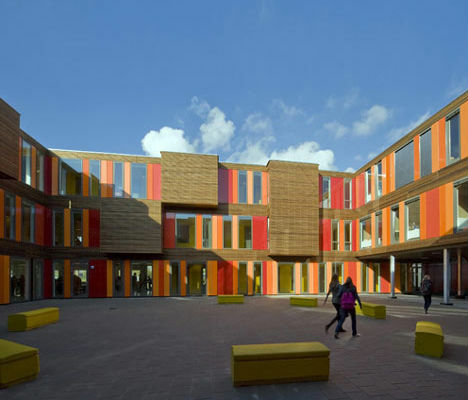 The former harbor area of Houthavens has blossomed from disuse into a hip cultural hub packed with similarly modular multi-functional housing, retail and restaurant buildings – a fitting environment for an unusually forward-thinking school design.